Clare maintained their half-time lead to run out three point winners over a battling Kilkenny in Nowlan Park today. Clare started the brightest but a spirited Kilkenny asked the banner men alot of hard questions during the closing stages, it wasn't enough however and a goal was the difference when referee James McGrath blew the final whistle. Click below for article by John Knox (Kilkenny People). The Kilkenny Team to play Clare this Sunday has been announced. The game has a throw-in of 2pm in Nowlan Park. Click below for full details. 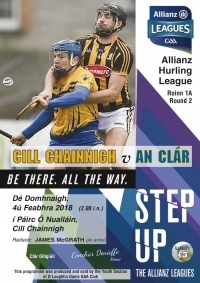 Kilkenny welcome Clare to Nowlan Park on Sunday for the Allianz League second round. Clare beat Tipperary in their opening game of the league while Kilkenny came up short against Cork last Saturday night. Both teams will be anxious to claim two points from Sunday's encounter. Admission to Nowlan Park on Sunday is Adults €15, Students/OAP's €12 and U16's Free. Avail of discounted tickets at Supervalu and Centra stores up until Saturday night, this speeds up your entry to the ground on Sunday. Gates will be open from 12.45pm, Early entry to the Park on Sunday is advised. Parking on the day is available in O'Loughlin Gael's GAA Club adjacent to Nowlan Park and the Kilkenny County Council Car Park, adjacent to The Rivercourt Hotel, access off Maudlin Street. Kilkenny lost their Allianz League opener to Cork on a scoreline of 0-24 to 1-24. In front of an attendance of 16,189 both teams played well, Kilkenny will be happy with the spirit and energy shown throughout the 70 minutes. Clare are next up for the Cats next Sunday in Nowlan Park. The Kilkenny team to play Cork in the Allianz League First Round has been announced.